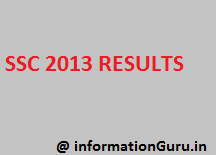 Staff selection commission (SSC) of India declared results of Special Limited Departmental Competitive Examination, (LDCE), 2012 for UDC Grade for the Select List year 2003. Here are the all usefull links to see your result. This exam was conducted in 3 parts, with written tests (in 2 parts), 918 candidates were appeared first round of exam and from 918, around 630 candidates qualified for second round of written test. This result is for these 630 candidates. In the final result (2nd written test) total 373 have been passed. Please see in the link of official SSC India websites mentioned above.